Please join us in court this Wednesday, Oct. 24 at 9:00 am. San Francisco Superior Court, 400 McAllister at Polk, Room 302. The question before the court will be: Should attorney fees in the amount of $243,000 be imposed on the six plaintiffs in Field v. Bowen as punishment for challenging in California courts the new anti-democratic election law? We seek to fill the courtroom to make clear that supporters of basic civil and democratic rights are keenly concerned with the outcome of the proceeding. Update: on October 8, the hearing originally scheduled for September 25, and then postponed to October 9, was again postponed. The new date is October 29. A hearing on our constitutional challenge to California’s “top two” elections has been scheduled for October 29. This hearing will about defendant Debra Bowen’s “demurrer” to the suit (a demurrer is a motion to dismiss a lawsuit without holding a trial). Unless the court grants the defendant’s motion, there will be further hearings on the merits of our case. This article was originally posted at IndyBay.org on April 10, 2012. Yesterday, KPFA Radio’s The Morning Mix spoke with representatives from California’s third-parties about their legal challenge to Proposition 14, Rubin v. Bowen, which created the new statewide ‘Top Two’ electoral system. Under this system, the rigged de facto two-party system has now been virtually codified in California. Given the obscene amounts of corporate funding expended by the pro-1% Democrat and Republican parties, third-party voters are, essentially, disenfranchised under this clearly unconstitutional legislation. After two months of delays, a lawsuit challenging the constitutionality of California’s new “top two” election scheme will be heard in Alameda County Superior Court on Tuesday, April 10. The hearing is scheduled for 9:00am on April 10 in Department 16 of the court, located at 1221 Oak Street in Oakland, before Judge Lawrence John Appel. If there are last minute changes in the schedule, they will be posted here. Oakland, CA – Three of California’s six recognized political parties, along with eight registered voters and prospective candidates, will file suit on Tuesday, Nov. 22, to block state Secretary of State Debra Bowen from implementing the “top two” election system mandated by Proposition 14, a ballot measure approved by state voters in June 2010. The suit contends that Proposition 14 violates fundamental constitutional rights of both parties and voters because it would effectively bar small-party candidates for most political offices from the general-election ballot. 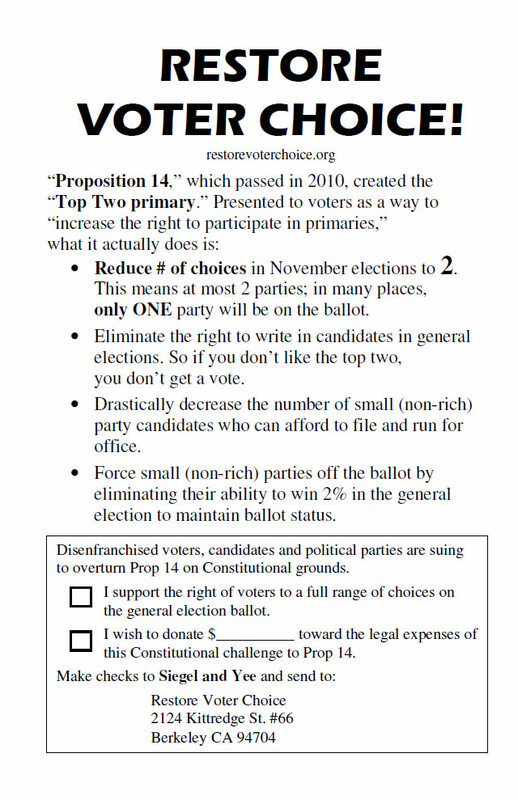 Under Proposition 14, the only candidates listed on general-election ballots would be the top two vote-getters in primary elections in which all voters, regardless of party preference, would chose from a single list of all candidates. In most districts, the likely result would be that the general-election ballot would include only a Democrat and a Republican, two Democrats, or two Republicans.